1. Community Charitable Contributions - The interest from all our escrow accounts is supplemented with a company contribution, and distributed to local 501c3 organizations whose applications are reviewed by our Charitable Contributions Committee. The committee, comprised of representatives from our offices and associated services, decides the recipients in the 1st and 3rd quarters of each year. 2. Michael O'Shaughnessy Scholarships - Awarded Annually by Carolina One Real Estate Services in recognition of Michael D. O'Shaughnessy for his hard work, vision, and everlasting contribution to the company's growth, strength, and success. For the past 8 years the company has been awarding college scholarships to children of our staff and agents. Since 2007, the company has contributed nearly a quarter million dollars in college scholarships. Qualification, deadlines, and application forms are available on our Intranet site. Scholarships are awarded each spring, and reviewed mid school year, by the Scholarship Committee, comprised of representatives from our offices and associated services. 3. Community Events and Fundraisers - Every year our agents and staff are involved in major intiatives within our community. One example is the company wide participation to raise money, pack and deliver boxes of food to needy families for Thanksgiving Dinner through the Basket Brigade. Additionally, we have raised money and gathered to walk for the March of Dimes and the Komen Race for the Cure. Going forward, we will have a committee, again comprised of representatives from each office and associated service, to promote and help organize these events each year for company wide participation. You'll also occassionally see Carolina One represented at annual fundraising events throughout the community. As the market continues to improve we hope to increase this participation. 4. 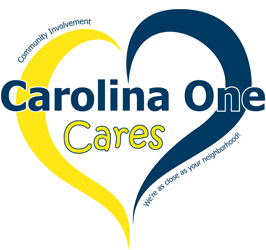 Carolina One Care Community Volunteer Week - New in the fall of 2012, we will designate one week as Carolina One Cares Community Volunteer Week. Each office, associated service, and administration will select one worthwile cause to support through volunteering time and labor and/or raising money during that week. 5. One on One - Whether it's a "Sunshine Committee" within each office to make and bring dinners to someone within our office or company who's struggling, or adopting a family at Christmas, there are numerous outpourings of love and care and help every day. These have no official name, no schedule, and no committee but come spontaneously from the heart. It's who we are and what we do.